Top quality HT lead with a pre-fitted plug cap with 5K Ohm ceramic resistor for use with a spark plug with a solid post type connector. The plug cap is rubber and with a 90 degree bend. The wire is 50cm long has a silicone cover with an inner core of solid copper wire strands. 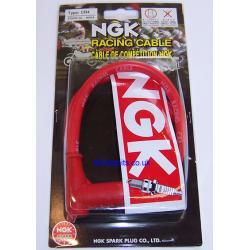 If you want to use this with a coil with a captive HT lead, a suitable NGK splicer is available from this site.